Miss Sky went as the local Sammy Terry. And Little Sis as Old Witch. Wishing everyone a very safe and spooky Halloween ! 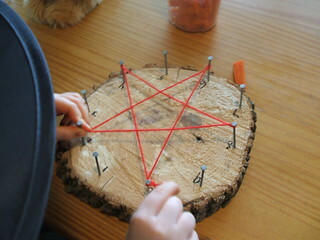 Anyway as I have mentioned before ,this year I am going to take a more relaxed approach to homeschooling. I asked The Little’s what they would like to add more of this year and the answer was more crafts and more games. I have to say I could not agree more. The Little’s have always loved to do crafts but last year I was so focused on getting the school year done I left out what we enjoy most about homeschooling. I have come to a conclusion that I will never be able to re create a Waldorf “school” at home and to be honest I don’t want to. 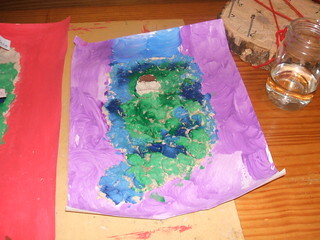 Now don’t get me wrong I love Waldorf Education but somewhere I lost the reason WHY I chose to” homeschool”. I never wanted it feel like school at all. So this week we will be taking a little detour bringing in more Halloween fun to our “school” day. It started over the weekend with a favorite family Halloween tradition. The Legend of Sleepy Hollow has become one of our favorite fall stories, with a reading every year before we head out to our local history museum for a reenactment. (Family memberships to local museums or zoos make great Christmas gifts by the way :))This year since I have been reading The Witch family we had to settle for listening to it on on audio book. We could not have asked for a spookier night And everyone made it home with their heads, well almost. Today after our walk we had circle ,keeping with this months list, but I added The Insey Weensy Spider fingerplay to the mix. Last year Miss Sky taught herself how to play Mary had a Little Lamb on the penny whistle, and we are using that tune to play the song Pumpkin Time on our penny whistle’s for Halloween. We spent the afternoon making decorations getting ready for this weekend (Pumpkin Head) and finished with reading. Miss Sky read the first 2 chapters of Charlotte’s Web by E.B. White (guess what this weeks theme is going to be 🙂 ) and I read to chapter 17 of The Witch Family. PS I am thinking of starting The Vimala Alphabet, has anyone else done this and do you like it? Man, it has been a full week of skating (guess who joined The Little’s and is feeling muscles I forgot I had? ), school, lectures, and errands. I have a lot of catching up to do. Being a week of review for Miss Sky we didn’t really have a main lesson we just touched on things she learned from last year. I combined grammar and math together by making a set of cards out of old paintings. I made 10 cards of each writing the words noun, adjective, verb, and adverb on the back. Then on the front, I came up with a word that fit each card. I spread them out on the table (back facing up) and had Miss Sky pick one card from each part of speech. She flipped through the cards to make a sentence. She then wrote the sentence out in cursive on paper and using this chart we found out which sentence was worth the most money. Small button stopped uncontrollably, turned out to be worth the most at $1.56. I had Miss Sky lay out the amount of each letter then count the total amount of each sentence. Next, I had Miss Sky give me the same amount but using less change. We also have played lots of games of I Spy where Miss Sky used adjectives to describe the noun we were spying. Also, I had Miss Sky come up with her own sentences using the same parts of speech and writing them in cursive. She worked on word searches and 4 column addition carrying and borrowing and we reviewed measurement. 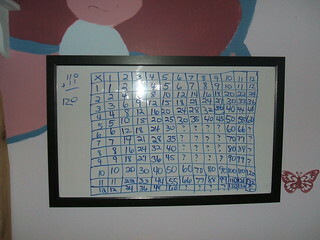 She did SO well with all of this and we are ready to move on all except for her multiplication. So we are back to tossing the beanbag. Today was Little Sis’s main lesson. This weeks theme was all about witches. First, we started with circle time(this has really become a favorite for Little Sis) where we recited Christine Natale’s verse Little Witch (message number 13581 in Waldorf Home Educators yahoo group). Then I brought out the beeswax. (Little Sis modeled the ghost). I also told the story, Kara, from simple kids, posted. This was a big hit but I think what made it even more fun was on the back of the pumpkins they decorated the inside of small witches house. Giving her and mouse beds with a fireplace, and a snuggle couch to warm by the fire and read a good story :). If that wasn’t enough we made witch broom cookies gluten-free style. We used this recipe (it doesn’t use any flour at all)with GF pretzels sticks. Here is the original recipe. Miss Sky finished Boo… and I mean it and I read chapter 15 of The Witch family. Witching everyone a ghostly weekend! The last few nights I have been listening to Steiner’s lecture The Roots of Education . I have found it to be very interesting and disturbing or maybe conflicting is a better word. In lecture one Steiner talks about how the teacher must harmonize their temperament due to what the child is exposed to early on will become a health problem for them later. He goes on to use an example of a choleric teacher. I think I have mentioned before that I am choleric, yes with LOTS of prayer and meditation I have been working very hard at bringing balance to my temperament, but choleric is still the most dominant. For me to say my children have never been exposed to my “temper tantrums” in all the years of their life would be a huge lie. Steiner goes on to say that “we” are in charge of a child’s happiness, unhappiness, health, and sickness later on when the child grows up. In lecture two he talks about how the children, under the age of 7, are one big sense organ and even having bad thoughts around a child will cause illness later in life. Imagine how I felt learning that my little tantrums play a part in whether or not my children will grow up to be healthy adults (Yeah no guilt trip there). One thing about listening to Steiner is you have to let it soak in for a while and that is just what it has been doing these last few days. I think Steiner was a very intelligent person and I have seen how spot on this curriculum has been for my daughter (I mean down right spooky at times) but I have to remember in these lectures he was talking to teachers. That at the end of the day they could go home and kick off their shoes. As homeschooling parents we are home, there is no separation. So these last few days I have tried to imagine what it would be like for my children if they saw me as always being the “perfect” teacher. To never allow me to have a negative thought or to get upset around them. What kind of illness would that cause as adults? We are after all human beings. Yes, I believe in the three bodies( body, soul, and spirit) but my body tends to get the best of me at times no matter how much time I spend in prayer. Now I have not finished the lecture and hope to listen to part three tonight and did get some good points about the importance of sleep, and how we grasp something once we gain a mental picture of it. I am very glad for the beautiful weekend we had weather-wise, it is not a normal thing to be able to celebrate Miss Sky’s birthday outdoors. I do believe she had a good day. We try to take the focus off of receiving gifts and more about the celebration of her life. I wrote both girls a story about their birth and we usually start the day off with that. Then it is up to the birthday child to choose the day’s activities and what meals they would like. Miss Sky chose to spend the day outdoors with a trip to the apple orchard (for more of her favorite food) and riding her bike along the park trails. We were sure to not waste one minute of the precious sunshine. I have decided to start a math block instead of the planned Human and Animal block, I felt it flows better coming after the geography block. We have a lot to catch up on and after our walk, we started with a review of the times tables learned last year. and we filled in the tables she knew showing how many she still has left to memorize. I have to say I was surprised she remembered these at all since we did not practice all summer. She does have a hard time answering if they are not given in order so we definitely must work on that. We also practiced telling time, I had Miss Sky say what time it was when we went for a walk, started school, at lunch, that sort of thing. Tomorrow we will work on reviewing money. During math blocks, we don’t have spelling or vocabulary. I feel with each grade comes more “schoolwork” and this can make for a really long school day. So I try to divide up lessons to keep our days running smoothly. I also firmly believe in letting subjects rest. So we will be practicing Miss Sky’s handwriting (cursive) and grammar during this block. I have also included a new memory poem each month during our circle time this year. We reviewed what a sentence was. How it starts with a capital letter and ends with a punctuation mark. We also reviewed what the punctuation marks are. Next, we reviewed the parts of speech she learned last year, noun, verb, adjective, and adverb. I asked Miss Sky to give me a noun, verb, adjective, then adverb for example. Then had her make this into a sentence. Red cat running fast. After each sentence Miss Sky copied it into her grammar MLB in cursive. I hope to have Miss Sky writing her own summaries by the end of the year. Miss Sky finished her Magic Tree House book last week and today read the first 2 chapters of Junie B., First Grader Boo… and I mean it by by Barbara Park. I read to chapter 9 of The Witch Family. 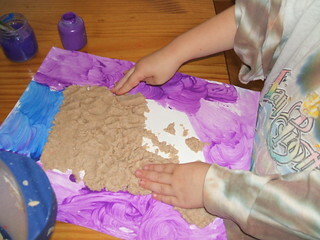 Miss Sky finished her salt dough map of Indiana She was really excited to share her knowledge with Papa and I am really impressed with how much she actually learned. Little Sis finished her map too. Also while waiting for the next installment Miss Sky has taken it upon herself to re-read Ozma of Oz again. We are very excited they will be performing this story at The Children’s Museum and Miss Sky has been busy getting ready. Alright, today has been one of “those” days. You know the kind when everything seems to be against you. I could run down the very long list of items, such as the disastrous breakfast this morning (found out we do not like mochi) then the(much-needed) rain shower on my freshly washed laundry, to misplacing items that you KNOW were there the night before but have somehow managed to walk away all on their own, and a dog that chewed up one of my fall fairies (ugh). Add to this a couple of children that think I am invisible (“what, did you say something mommy? I didn’t hear you”), another that is extremely emotional crying at any and everything( “why did you look at me like that”), and a phone that won’t stop ringing. Maybe you can sympathize. Now I know this is not the end of the world, it was just trying my patience that seemed to have stepped away for the time being. I felt very close to throwing in the towel. I feel like everything that has brought me peace of mind before has disappeared. (Yes I WOULD like some cheese with my whine thanks, but we happen to be out at the moment). “I AM IN TIME OUT !” I declared as my family turns and gives me a look like what the heck is your deal. I picked up my notebook (you never know what answers you may receive)and stomped off toward the bedroom for some much-needed meditation and prayer. Of course, the answer always comes back to me. Yes I have been staying up way to late,yes I am putting way too much pressure on myself (why do I do this? ), and yes I have been flying by the seat of my pants with no menu plans for the week( I am letting things like caramel color, which is gluten, in vanilla ice cream bother me. *side note rant*I wonder why we are eating too much, it’s in everything. I mean come on). I will spare you the temper tantrum details of what happened next. Despite my little disruption this afternoon, we did manage to get something “school” related done. We handed the job of going inside to pay our sewage bill over to Miss Sky(remember small town). So today using her map of our city, that she drew out, she sat up in the front seat next to Papa dictating directions on how to get to city hall finding the shortest route. Then she had to tell us how to get back home. She did well. Yesterday Miss Sky practiced her spelling words by looking at her words then closing her MLB. She wrote the word on paper. Then she checked to see if she spelled it right.If she got it wrong she would copy it from her book next to the misspelled word. Today, using an idea from Our Little Nature Nest’s blog, I scattered gems on the floor and Miss Sky had to pick them up with her toes while spelling out her words. She switched to her right and left foot. She finished looking up this weeks vocabulary words and wrote out the definitions. She should be able to use them in a sentence for her test Friday. Yesterday Miss Sky made a map of our state in her MLB and recited back to me how Indiana was formed. Together we came up with a summary and she copied it in her MLB. 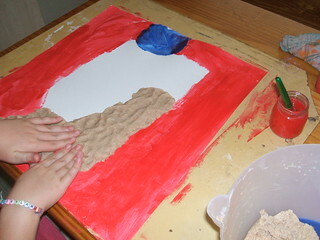 For her end project, she is making a salt dough map of our state. Little Sis is making one too. I really like how they turned out. She will finish painting it tomorrow. I used the directions from here. Miss Sky is in chapter 9 of Sunset of the Sabertooth and I read chapter 7 of The Witch Family. I have to say we LOVE this book. “To those children who move unhesitatingly between the real and unreal” Yep that’s us :). Well we have officially made it past 1 month of being gluten-free. I wish I could say it’s been a piece of cake (ok really bad choice of words) but it hasn’t been. The funny thing is it’s not having to give up bread that is the hard part but it’s the making bread part that I miss SO much. I don’t really miss the taste of bread as much as I miss the smell of it baking in the oven. Then there are all the lovely photos on-line(*sigh*). On the up side we are all feeling much more energized so I guess I will just have to get over it. I did have this same feeling when I gave up coffee. Though I still find myself needing to go down that row for something or other to take in a quick sniff. Maybe I need to find a local bakery that will not think of me as weird for just wanting to capture the scent :). Looking back over past posts I am really pleased with how this block all came together. We still have 2 more “trips” planned in the works to visit the sand dunes way up north and the caverns way down south but they might just have to wait till next spring when the weather begins to turn warm again. I can’t believe after all the years I have lived here I’ve yet to see the great lakes. So that is most definitely on my to do list. After our walk around the block today’s main lesson was all about the ice age. I explained to Miss Sky how glaciers carved out the land and when they began to melt they created the sand dunes, flat prairies, and the rolling hills that make up Indiana’s landscape. We talked about what we saw on our trip over the weekend. I drew an outline of Indiana on the board and divided it into 3 main land regions, the great lake plains, the till, plains, and the southern plains and lowlands. We talked about how different each one was and about the plains we live in. Miss Sky has taken notice to all the cornfields and soybeans we have growing around every corner and I explained that we lived in part of the corn belt which has excellent soil for farming. We talked about how different the scenery looked the farther south we drive and explained how glaciers never made it that far so when they melted it formed the hills and caves that are carved out of limestone. On our hikes at Brown County State Park we have been able to observe much of the limestone there and even have brought some home for our nature table. Having fertile soil, mineral deposits, and abundant water is what makes our state such a great place to live. Tomorrow I will talk about the indigenous people who lived in our state and how the great lakes and rivers played a big part in that. This site played a big help in my research. Next I gave Miss Sky this weeks spelling list. We marched them out and Miss Sky copied them once in cursive and printed them once. We also looked for hidden words inside the words. This helps her to memorize them much quicker. For form drawing Miss Sky practiced a metamorphosis form representing the different stages of the earth forming during the ice age. Miss Sky practiced first in the air with her right hand then her left. We called it a day with Miss Sky reading to chapter 3 of Sunset of the Sabertooth by Mary Pope Osborne and I read the first 2 chapters of The Witch Family by Eleanor Estes. This week we branch out from our city and start learning more about the state we live in. Starting with the largest lake in Indiana. Lake Morgan Monroe 23,952 acres. Last week we learned what a lake is so I thought it would only be fair to actually see one. 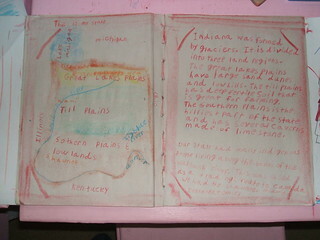 This week I will be talking about the different landscapes of Indiana and how they were formed. So on the way to our destination we paid attention how the scenery changed the farther south we went. What was farmland quickly changed into hills filled with beautiful images of fall. Due to the lack of rain our state has faced the lake was much lower than usual. This worked to our advantage as we were able to see just how water can change the formation of the earth. This trip was not all work though. but the true adventures began as we watched the sunset and the stars shine out over the water. How different everything looked in the dark. No street lights, no noise from traffic just the sound of fish coming out to play while the waves gently rolled onto the shore. With only our compass and a lantern it was time to find our way back to our vehicle so we could start our journey back home. If everything goes right this will be our last week of our geography block but most certainly not the end of our adventures.